This is from a traditional and much loved recipe providing a long lasting solution to retaining the good looks and longevity of your wood. Using this cream will remind you of past times ! 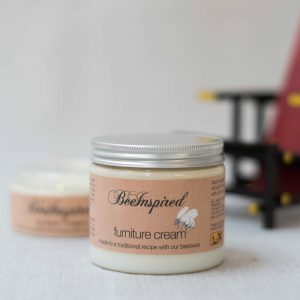 Turpentine and beeswax are a classic combination for bringing out the best in natural materials and wood will be left with a soft sheen and we add a hint of lavender too. Apply with a soft cloth and rub in circular motion across the surface. This cream cleans too so the cloth will become discoloured. Leave to soak in and then buff with a fresh cloth. It’s only necessary to use this cream every few months or if your wood is looking lack lustre and between times dust with a dampened cloth.